NYFW. I’ve been eyeing this coat for such a long time and when I found it at the Zara sale I couldn’t help but buying it, so perfect! Right now I’m heading out for dinner but stay tuned for the full look in tomorrows post, and don’t forget to follow me on instagram @carolinaengman. LEOPARD COAT Zara. BAG Proenza Schouler. 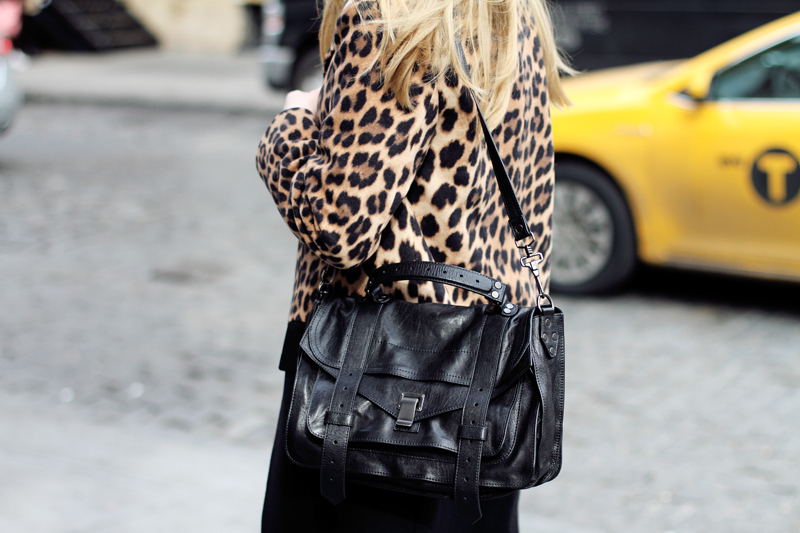 This entry was posted in Details and tagged leopard, nyfw, Proenza Schouler, ps1 by Carolina Engman. Bookmark the permalink. Looks great! love the leopard coat. That coat has the perfect leopard print!! I’ve been eyeing this coat during the Zara sale as well.. it’s totally you though.. I don’t think I can pull it off as fabulously! I contemplated getting that last week, it was still available on the website… now you’ve brought back the temptation. That coat is amazing!! Want one! I love that coat! And I have been absolutely lusting after a PS1 bag for toooo long. I’m usually not a big fan of animal print… but this is lovely! nice… get what you want. Thank you for justifying my recent purchase of a leopard jacket! Mine is vintage (by Best & Co), cropped with 3/4 sleeves. It’s so amazing I almost fainted when I found it. Great minds think alike! I love that bag – It’s the perfect match for that beautiful coat! Fabulous coat & I love that bag – So versatile! One day the PS1 will be mine! Oh I absolutely love this coat! Rarwrr!!!! in the city Carolina!!! it’s absolutely Chic!!! The coat is amazing! Perfect cuts! my favorite pattern with the coolest versatile bag!!! XOXO!!! check it out guys! I have to agree about the perfection of this coat (and of the bag for that matters)! I really love that leopard jacket and I love Zara too. Have a great day. Your coat is really nice. We have also decided to use the leopard in our jewels. Your coat is really nice. We have also decided to use leopard on our jewels. This bag is stunning, but I love the coat, too. I have it, Love it! Gorgeous coat ! love it ! Got the same one and I’m happy about it! Great coat ! I love leopard prints ! really love that statement coat and the bag is an absolute dream! can’t wait for the full outfit! Lovely look. I wanted that coat but sadly it didn’t look right on me. Love your jacket! spent the whole weekend looking for a leopard jacket in Paris with no luck and then you found a perfect one on Zara! Such a classic! Zara has a seriously epic sale on at the moment! Perfect coat! Can’t wait to see how you styled it! I love it when I get great stuff on sale…following you on Instagram! Ooh, nice pic!! love your photography! This leopard print is amazing! i looooove this coat! i will wear it today for valentine’s night out!